Built in the 13th/14th century as a Dominican Church ("Dominikanerkirche St. Peter und Paul"). 1786 secularized. Subsequently insertion of a ceiling into the former church, used as a warehouse, factory, theatre and cinema. Since 1892, upper floors used as museum. 1969 ceilings removed, since then the church room is also used as a museum. 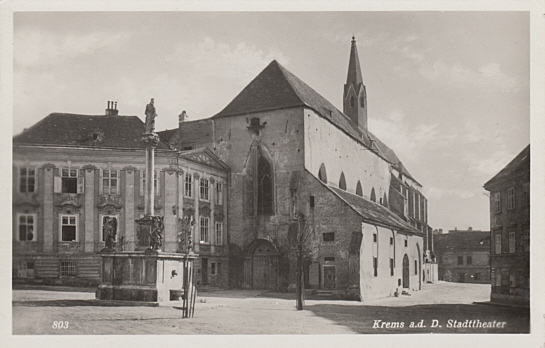 Front Text: "Krems a.d.D., Stadttheater"